Happy Monday! Boy today I have a great recipe for you!! Just look!! But before I go to my recipe, I want to thank Kristin from Beauty and My Feast for sending me such awesome goodies and being my Foodie Penpal this month. 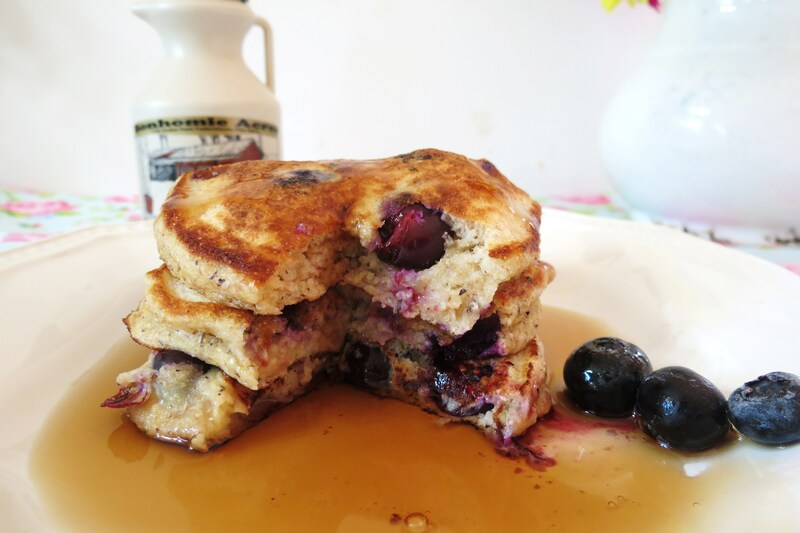 I made these most delectable, thick, light yummy pancakes with the Spelt Pancake Mix that Kristin sent me. She gave a great such great gifts, just look! She gave me Bee Pollen, which is new for me, but I love it. I have been adding it to my yogurt! I also got a jar of Italian Salsa, which I can’t wait to dig into. I plan on making bruchetta with it. A recipe will come later for that! She also sent me some Maple Syrup, which I just love! Of course the pancake mix, which I want more of and she even sent doggie treats for my two bad babies. The treats are from a The Three Dog Bakery, and the flavor is Strawberries and Creme. They LOVE them! No, I mean LOVE. I swear my boy was going to eat my hand right off. Look! 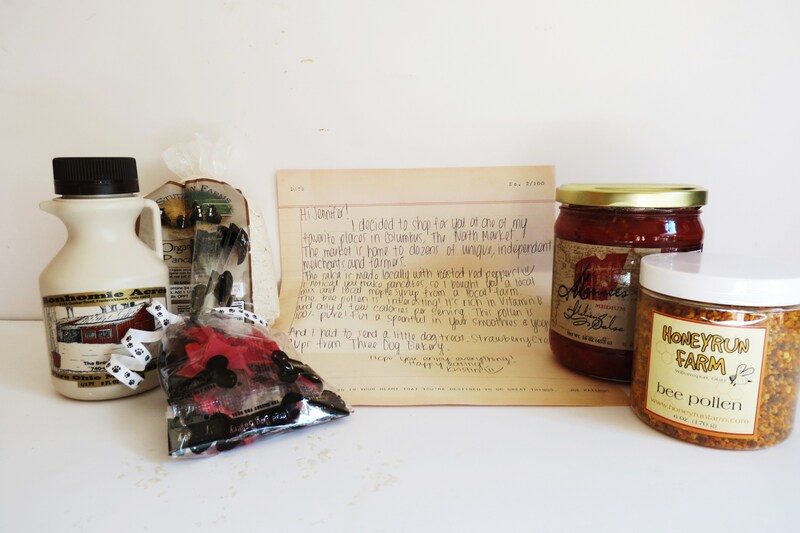 I was the Foodie Penpal for Mackenzie of Wealth is Health. Mackenzie’s Blog is about healthy living, exercising and family. You should check her blog out and you can see what I sent her. I swear we need to up the $15.00 that we are limited to spending on our Foodie Penpals. It’s so hard because there’s so much I want to get!! So check out Mackenzie’s site! If your interested in being a Foodie Penpal, click this link and contact Lindsay from the Lean Green Bean. ***If you’re in the UK, please contact Carol Anne from This Is Rock Salt at [email protected] to get involved! 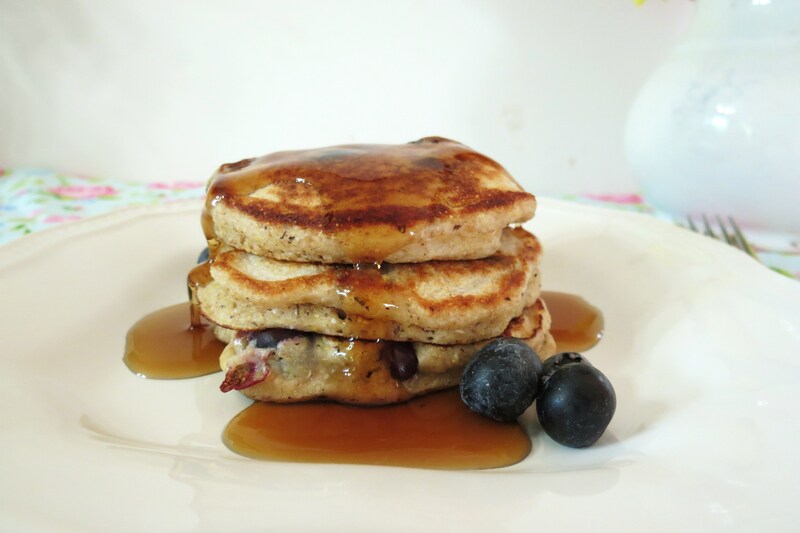 Now back to my Blueberry Pancakes. You know I normally try to change it up with my pancakes, but what I found funny is I never made traditional Blueberry Pancakes, so this morning I thought I would make some. I picked up the freshest, plump blueberries from the Farmers Market. Oh man were they good. Honestly these are probably one of the best pancakes I have had. It’s simple, loaded with berries and so dam good!!! I love the Spelt Pancake Mix. Now you know me, I didn’t follow the directions on the package. 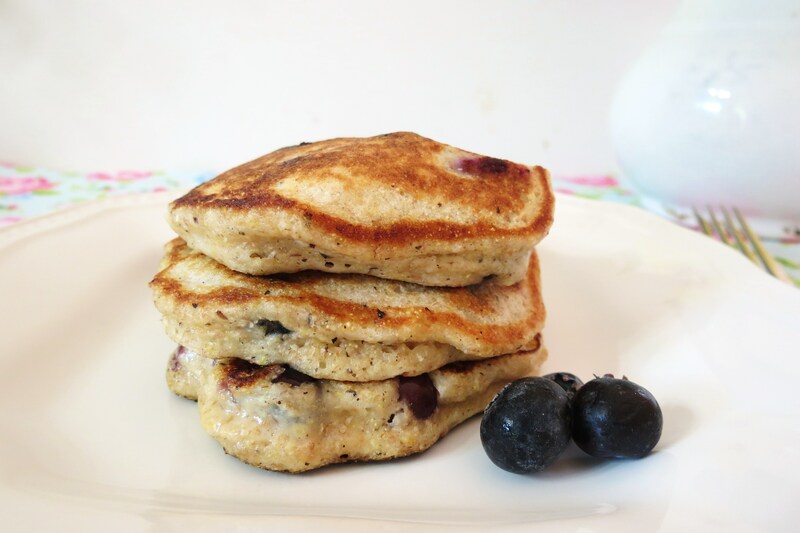 I took the Spelt Pancake Mix and made my own recipe. I used, of course Greek Yogurt, egg whites, dash of sugar and vanilla extract. I’m always trying to find ways to cut calories without sacrificing the flavor. Three of these pancakes came in at 165 calories. Nice, huh! 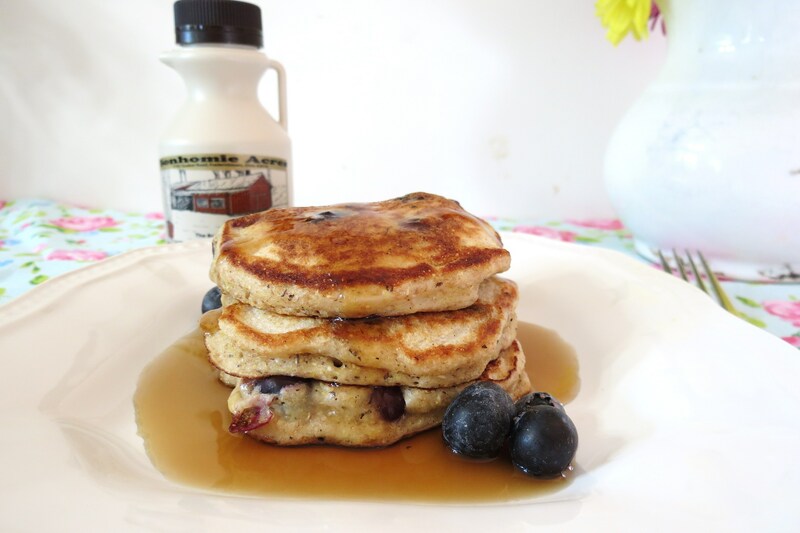 Now don’t worry, you can make these pancakes without the Spelt Pancake Mix. You could use another pancake mix or make your own, which is basically, flour, baking powder, salt & sugar. I’ll give you alternative ingredients in my recipe below. 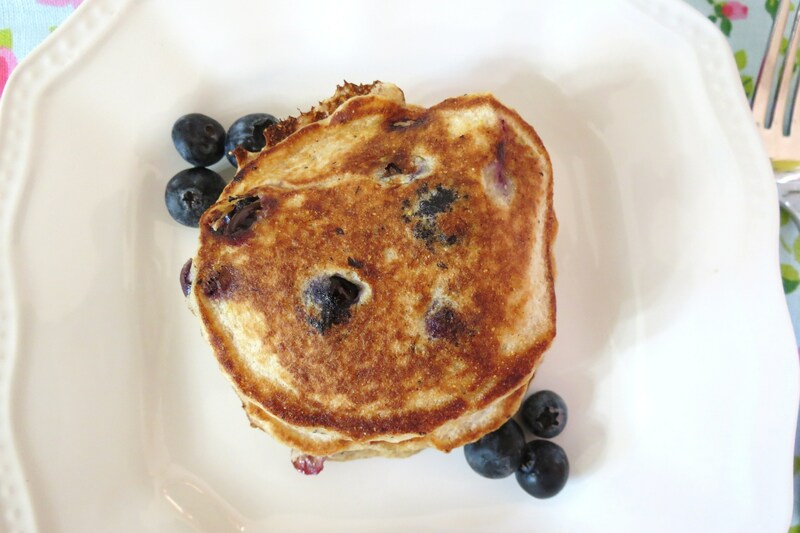 A healthy, fluffy, thick Blueberry Pancake, made with Greek Yogurt and Spelt Pancake Mix. Place scant ¼-cup batter onto non-stick skillet and cook till bubbles start appearing through the top of the pancake and then flip. If you don't have Spelt Pancake Mix, you can sub any pancake mix you have or add the following ingredients to the recipe: ⅓ cup Whole Wheat Flour, ½ teaspoon baking powder and a dash of salt. This post is getting long, so I am going to sum it up and tell you that you should really join the Foodie Penpal Program. It’s so much fun! I love getting unexpected goodies in the mail. As for me I am signing off. Have a great week!! But before I go two things! One don’t forget to enter my giveaway. I pick a 3 winners later today! Second, just look at these pancakes!!!! I know it’s weird to show you food I have started to eat, but look at it!! I just signed up for the Foodie Pen Pal group! Your post just got me so excited about it…don’t know why I’ve been waiting so long! Those spelt pancakes are fluff. central. love. The Foodie Penpal group is so fun!!! I can’t wait to see what you get next month!! Maybe we will end up being Foodie Penpals. That would be a hoot! the north market is amazing!!!! and those pancakes sound great! I want to go shopping there! I love items like this! Thanks for creating, making and hosting the Foodie Penpal Program!! It’ so much fun! What a fun idea this Foodie PenPal thing is! Your pancakes look so mouthwatering, Jennifer. Great recipe! 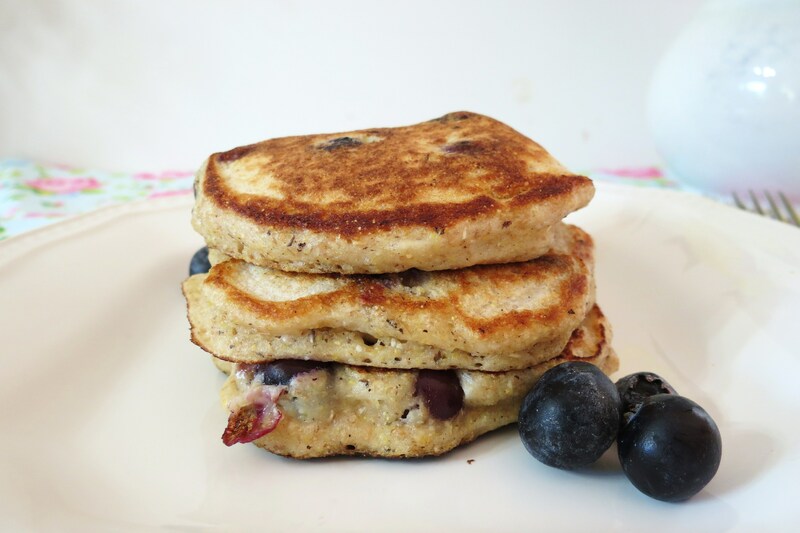 Oh dear, blueberry pancakes are my weakness and now I have them “on the brain”! 🙂 Yours sound wonderful and your pen pal sent you a wonderful package, how fun to get something like this is the mail! I love this program, because I love all the different kind of goodies I get!! I learn about new and fun items! The pancakes were so good! I love the Spelt Pancake mix!! Oh my gosh, this is making my mouth water. So big and fluffy! I’ve actually never worked with spelt, but have wanted to try it. These pancakes look perfect! I’ve used spelt oats in granola, but this is the first time I baked with it. It’s good, I didn’t notice to much of a difference and the best part is it’s healthier, more protein! Okay, How have I never cooked with spelt?! These look amazing! I’ve been seeing lots of recipes containing spelt flour. I might have to head to the fancy grocery store and find some! Also, this foodie pen pal thing is a really neat idea! Very cool to get local stuff from another town! I’m so glad you loved everything Jen! Your pancakes look absolutely amazing.. my God! So fluffy! 🙂 And I love the pics of the pups and their treats. Made my day! 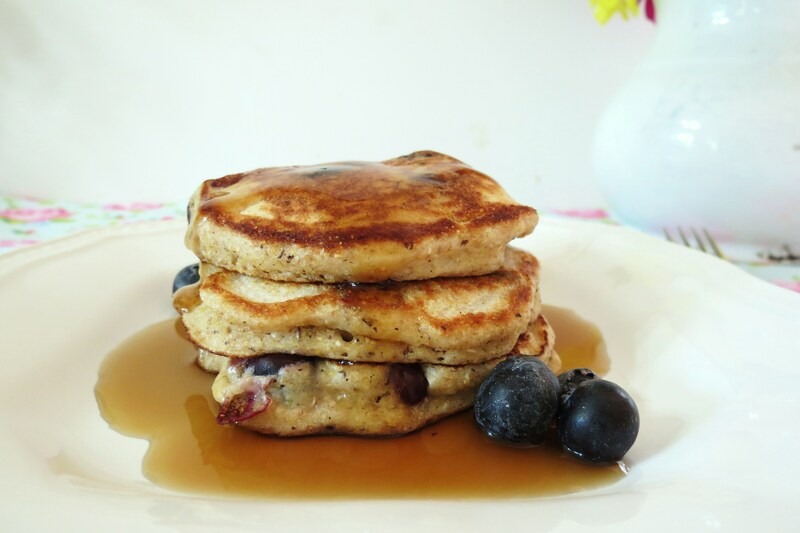 These sound just like the pancakes I love to make at home! Low fat, high protein, and digestible (boo to wheat sensitivities). Yum!